Load or unload liquids from the top of the tanks safely and securely for trucks, railcars, small or big containers, ISO containers, drums of 220 liters, etc. KANON top loading arms come in different designs depending on the application. These can be open filling systems as they are commonly used in for a wide range of products across all industry sectors. But they can also be designed for closed filling for highly aggressive liquids associated with the chemical and petrochemical industries. Loading arms can be executed with or without vapour return or pressure line. They can outfit with top level detection (bubble pipe sensing or electronic). A telescopic drop pipe can be integrated to prevent foaming or electrostatic build up. Adding a press down cylinder will prevent arm lifting or add a drop pipe deflector to prevent dripping. 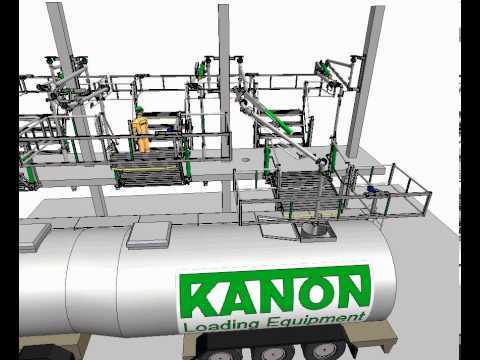 Kanon top loading arms are provided with four swivel joints for the product line and a counterweight or multi-coil spring cylinder balance system. KANON Loading Equipment (http://kanon.nl/) is a Netherlands-based first-class supplier on the international market for Marine, Rail and Road liquid transfer systems.